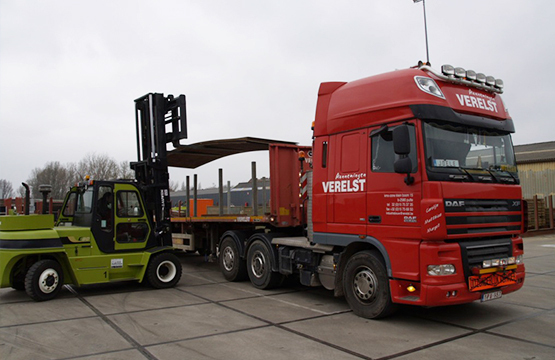 We offer our own transport team for flexible deliveries and/or installation. Our steel axle equipped semi-trailers can carry up to 24 tonnes per load. They can be supplied with tractors with 4x4 steering for difficult terrain, as well as a remote control with which the crane operator can switch the tractor-trailer combination. They will install the steel road plates or crane mats according to your layout, so you as the client will not have to do anything. Plastic road plates can also be delivered, the client being responsible for their installation. 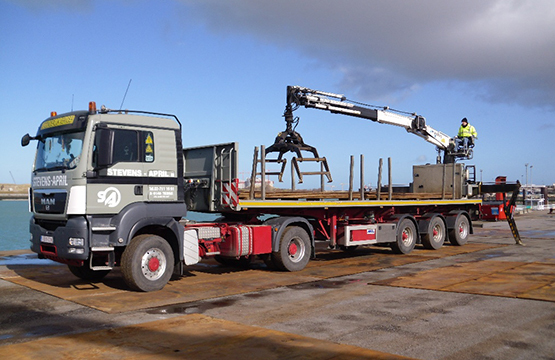 The flatbed trailers can carry up to 30 tonnes per load and will be unloaded on the building site by our team or yours. Collections can be made between 08:00 and 12:00 and between 12:30 and 17:00. We will load your vehicle with our forklifts. Closed during construction industry holiday periods.